went on behind the scenes of this 2nd birthday party. The theme was pretty easy. 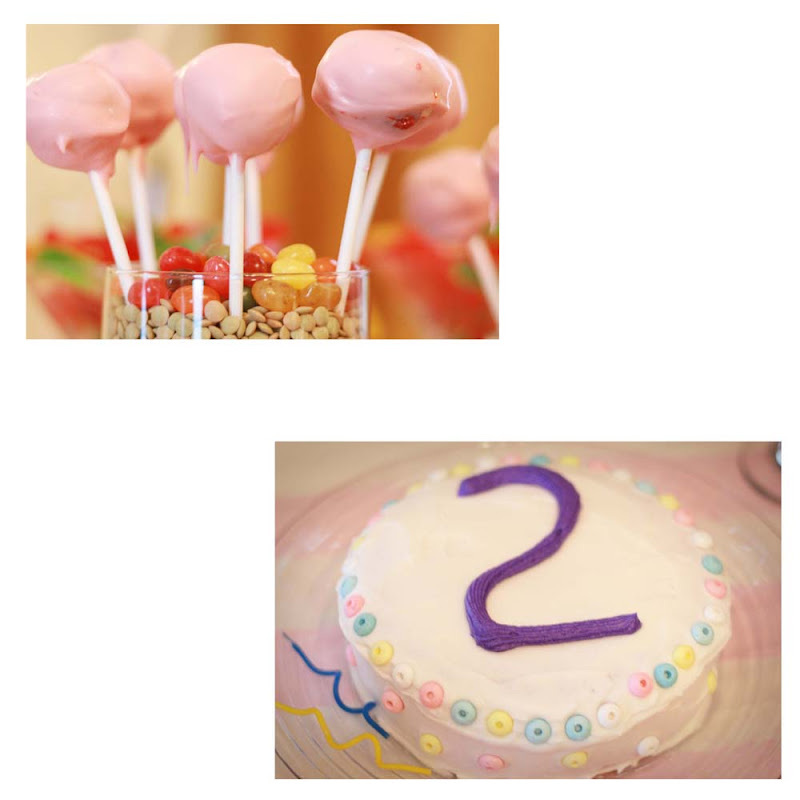 One of my favorite sites for party ideas is Design Dazzle. I was stuck between the Milk & Cookies party and the Candy Bar. could be done my theme was decided. Her Mema got her an adorable outfit to wear that had a 2 on the shirt and a cupcake skirt. 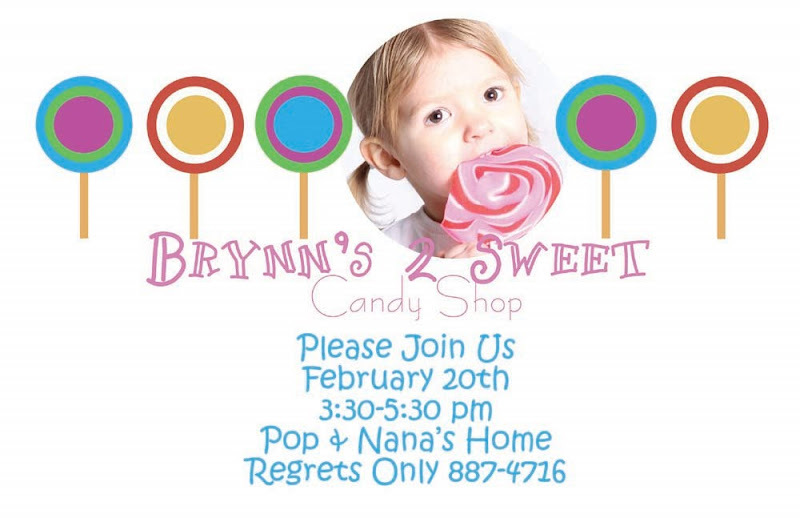 I took photos of her and the lollipop and preceded to design her invites in photoshop. I'm pretty pleased with how they turned out! On to the Candy Bar!! Most of the glass jars were flower vases I had or were borrowed. All except for the round ones with the lids. They were half off at Hobby Lobby! Love that store. & were inspired by the oh so talented Bakerella. Nana is the baker in the family and created these as well as the Birthday Cake below. These were soooo easy and so stinkin cute! I got 2 big dowel rods, cellaphane and ribbon. The pool noodles were donated by Mimi & Poppy. See, no one thinks to sell pool noodles in the middle of February! Boggles my mind. Hot glue pool noodles into a circle. This is no easy task and must be done with 2 people. One to glue and one to hold noodle in place. Let it dry for a few minutes and ram the rod through the middle. Wrap with cellaphane. Tie with a ribbon and voila! Giant Lollipops! My next project was the Lollipop Topiary. Now for some reason I have a lot of different size styrofoam balls, ribbon and a lot of small/medium wood dowels laying around. So I used 2 of the balls, 2 of the dowels, got 2 silver buckets from the dollar store and some lollipops. Put square styrofoam in the bottom of the bucket and fill with marbles or rocks. Whatever you have to weight it down. Stick the lollipops in the styrofoam balls. Insert the dowel into the foam in bucket and hot glue it together. For extra support. Insert ball into other end of dowel and hot glue it at the base of the ball. Put tulle in base to hide rocks and tie with ribbon. 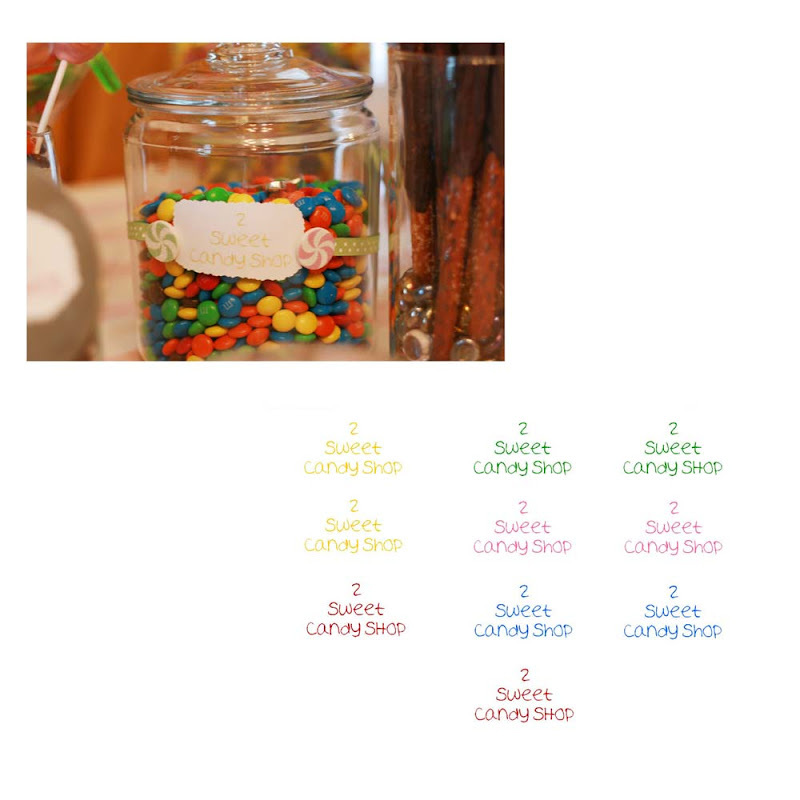 Now these jars would been cute just plain with the candy showing but, let's go one step further. I made up some labels. Printed them out and cut with scrapbook scissors. Used some of my extra ribbon from the topiary's to put around the jars. They looked OK but, something was missing. I had some old scrapbook stickers (you see, at one time I intended to scrapbook...then I found BLOGGING!) I think these were Martha Stewart. I added them to the sides of the labels. NOW it looks finished! It's all about the details people. Scrapbook paper cut into triangles. Unfinished wood letters from Hobby Lobby. Half-Off! Seriously people, Hobby Lobby has phenomenal sales! Paint letters and glue onto paper. Let dry and hot glue ribbon. AGAIN, Half-off unfinished wood chalk boards from HL. Hot glued excess ribbon I had from Giant Lollipops and add a few pieces of candy from crafts I already had. 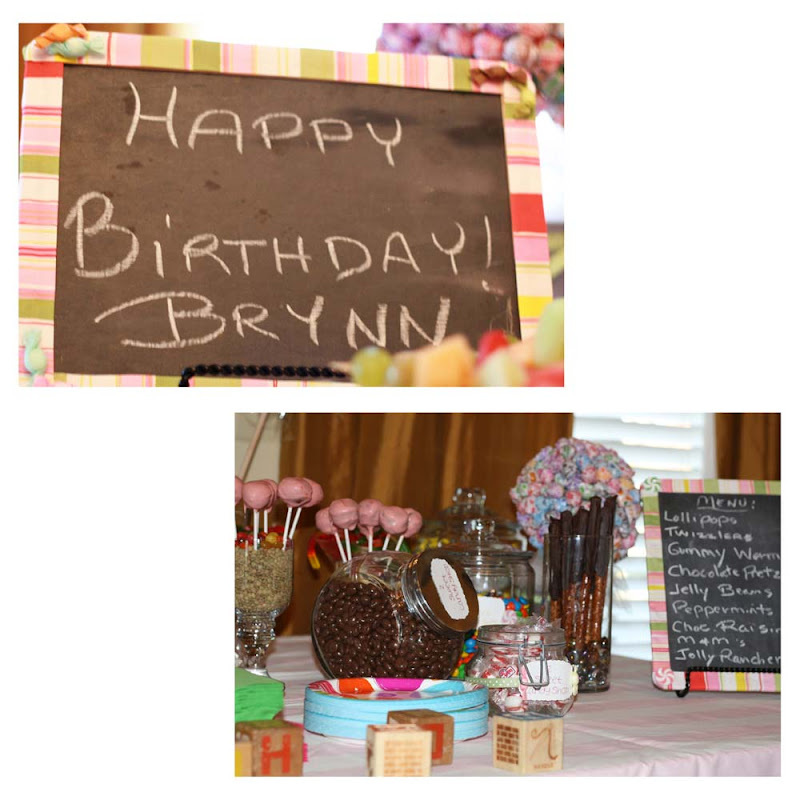 I used these for a HAPPY BIRTHDAY sign & for The Candy Store menu. 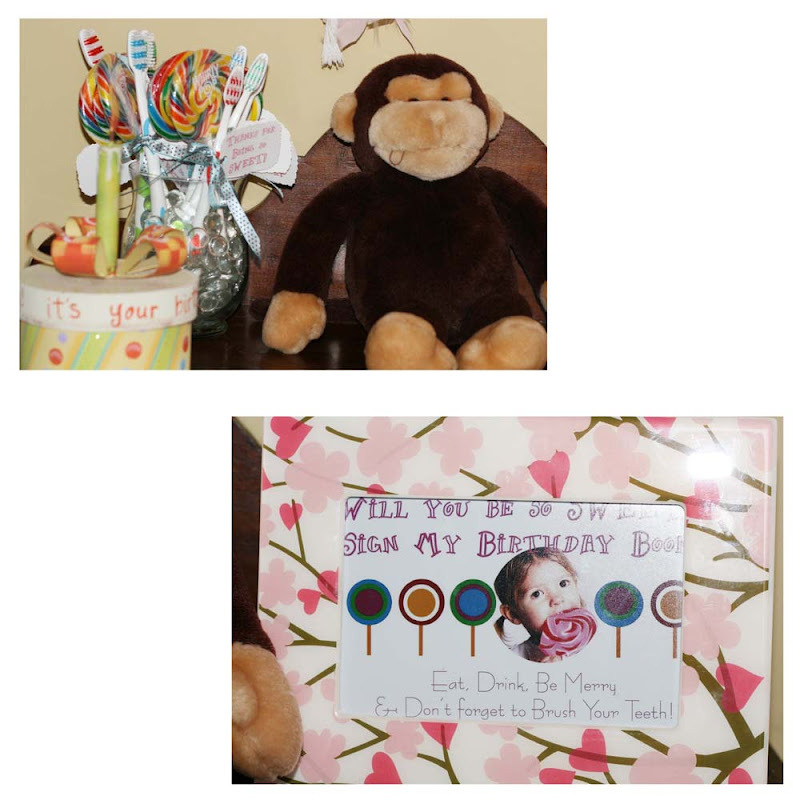 Last but not least...PARTY FAVORS & GUEST BOOK!! Logan didn't know what to get Brynn so I suggested the Dr. Seuss Happy Birthday To You book. We sat it by the favors and had everyone sign it. I made a little picture to go with it so people would know to sign it. Can you see the shout out to my favorite musician in the writing;)? All in all I think the party was a success! Lots of people commented on the decor. Yes, it was time consuming but, the crafts were not hard! Honestly, I think the more stuff you can do yourself, the more meaningful & in-expensive it will be! I had a blast doing it and I think she had a blast being the star of the show. I first heard of them at work. Girls of all ages were in search. You could tell as soon as they came in the door what they were after. They stormed in. An air of hysteria about them. A crazed look appeared in their eyes at the sound of the word. "No, I'm sorry! We've been out for a few weeks now." as they slowly backed away from the counter. The silly, stretchy, made-of-plastic bandz that will surely make their life better! I wondered to myself if Logan would like these. Nah, they're bracelets! They're probably just for girls! The first week of February he comes in the house. "MOM! 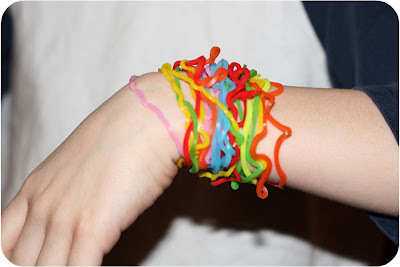 I need SILLY BANDZ!!!" "They're cool and stretchy and shaped like things and Evan has like 30 something and Joseph has like 60 something. Go to Wal-Mart, Blockbuster, CVS or maybe Walgreens. I heard the slightly muffled maniacal laugh start. Every day the same look, same questions, same laugh. I had, in fact, found them but was saving them for Valentine's Day. Oh it seemed like so far away! I considered giving them to him early to ease the pain but thought the surprise would be better. Surprises always are. So I waited and he panicked. He was BEYOND thrilled when he got them. Well, as thrilled as Logan ever looks. Eyes light up and a small crooked half smile forms. He wears them with pride. Patiently awaiting the day he can go back to school and begin his trading. The morning finally arrives and he's postioned them up his arm. "They're probably not even cool anymore. They've been around for a while." p.s. he was wrong. they are still way cool and have just been banned at his school.